I wrote a post the other day about how and why to tag your urls and a commenter posted telling me about an add-in for Chrome that makes the process even easier! Here’s a 3+ minute video on how to use the Chrome Addin Google URL builder. This entry was posted in Analysis and tagged Chrome, screencast, URL Builder on 24 April 2013 by AskJoanne. While chatting with a colleague today (Hello, Beverly Sastri), we were saying it would be so great to have a tool that could “scan” a website and generate a visual sitemap of the site. This is particularly helpful for site re-design and development projects so that you can see how all the pages of the site connect with one another. I have a wonderful tool called A1 Website Analyzer that I use to pull the page urls, titles, meta-descriptions, heading tags and keywords, for site analysis but Beverly wanted something more like a visual flowchart. So, here it is, PowerMapper. The maps can also generate an XML sitemap, can be exported to CSV, a webpage or an image. Here’s part of an image from StRoseChurch.com‘s website map. This entry was posted in Analysis and tagged "how to", analysis, flowchart, sitemap, visualization on 8 March 2013 by AskJoanne. While looking for new ways to play with Word Clouds, I did the cloud from the previous post on the SEOMoz blog main page. I have been using the clouds with keyword research as well, filtering on types of words, number of searches, etc. I wanted to find some public (not proprietary client data) to play with, so I thought about News. Some of my hobbies revolve around researching my Ancestry and Scrapbooking. I love the idea of preserving information for future generations. So, for the last couple of days, I have been pulling the keywords from the NYT Homepage. I exclude words that are related to date, brand name and function of the page and concentrate on keywords that are repeated 4 or more times (less than that and the cloud is very confusing!). Following are word clouds for the last 3 days. What do these images “tell us?” I’m not really sure. Right now, they’re just a snapshot in words of what was being reported/talked about on those days. When Tableau 8 releases, and word clouds like this can be uploaded to Tableau Public – where interaction with the data is possible, these might be more fun. Like looking at the frequency of certain words over time, looking for trends in weeks or months of data. It could be the basis for some interesting sociological research. Or it could just be fun, like looking at old snapshots can be. This entry was posted in Analysis and tagged keywords, research, tableau, word clouds on 27 February 2013 by AskJoanne. Using a word cloud can help you visually focus on the words that are being used most often on a site. And compare that to the words you WANT the search engines to see on the site. There are lots of variations of this keyword/word cloud theme… you could look at the Google AdWords keyword tool results of a scan of your site. Or, the keywords in your analytics account that show the keywords that are actually generating traffic to your site. Or the advertising keyword results via Google AdWords or Bing AdCenter. This entry was posted in Analysis and tagged keywords, research, seomoz, tableau, word clouds on 25 February 2013 by AskJoanne. It’s easy to see that Ask Joanne and other brand related keywords are the keywords with the highest search volume, but how else can we make sense of this data. In this word cloud, the size indicates the sum of visits to the site, the color indicates the bounce rate – orange is a higher bounce rate (only one page of site viewed), blue is a lower bounce rate. So, we can see that the phrase What is Yext brought in the greatest number of visitors, and that it had a high bounce rate. However, since it’s a blog post, it doesn’t bother me much that the page had such a high bounce rate. It would be good, however, to track if any outgoing links on that page were clicked (like to my Yext Affiliate link). I should know how to do this.. but with the asynchronous Google code, I actually have to research how to implement it. This entry was posted in Analysis and tagged askjoanne, keywords, research, tableau, word clouds, yext on 20 February 2013 by AskJoanne. 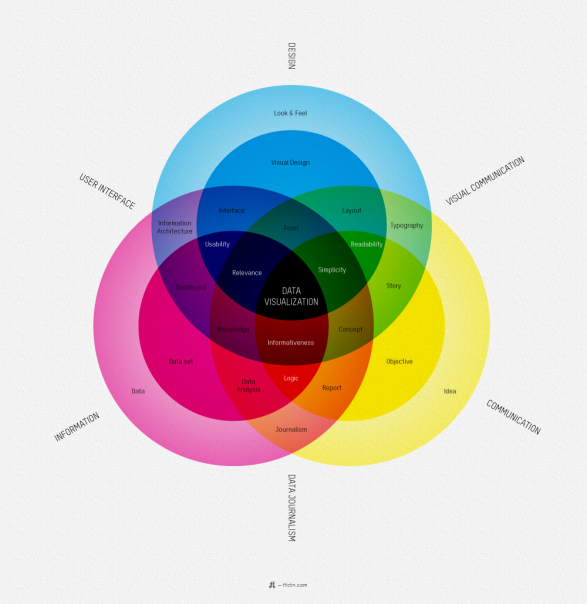 Visualization Rainbow showing interconnection between Information, Data Journalism, Communication, Visual Communication, Design, User Interface – with Data Visualization in the interconnected center with overlapping spheres. This entry was posted in Analysis and tagged analysis, data, infographic, research, visually on 19 February 2013 by AskJoanne. Working with Tableau has helped me to understand many of the ways that rows and rows of data can be turned into useful information. For example, I did a little bit of keyword research, using Google’s AdWord tool to try to find the best keywords for a potential client to optimize on. In Excel you can sort, arrange and even highlight certain rows based on criteria you set. However, by quickly pulling this data into Tableau, you can turn an unmanageable list, into a visualization that can clearly help you see where the keywords fall within certain criteria like greater or less than average search volume, greater or less than average costs-per-click and even by defining a range of search volumes, which keyphrases fall into a range that can reasonably be assumed to provide a good return on advertising investment. This entry was posted in Analysis and tagged analysis, data on 18 May 2012 by AskJoanne. Use the <ctrl> key to select more than one filter at the same time. Feedback welcome. More visualizations coming soon. This entry was posted in Analysis and tagged data, visualization on 20 January 2012 by AskJoanne.